In this picture-book read-along, spoken-word poetry celebrating food is interspersed throughout a simple story of Chef Roy Choi’s life. Choi’s love of food starts with his family’s restaurant, takes him to chef school, and moves into sharing his passion for food in his own food trucks and restaurants. Man One, who also the illustrates the book, provides the main narration, with reverb adding resonance when he performs the poems. Lee narrates the explanatory background notes on Korean food and flavors in a clear, refreshing voice. Musical backdrops for descriptions of Korean food are quieter, while louder hip-hop- inspired street beats back the poems describing food preparation. An echoey background voice reads all the incidental street signs, graffiti, and neighborhood names that occur in the artwork. The musical beats and sound effects match the upbeat tempo of this story, which encourages children to find their own favorite flavors, celebrate diversity, and cook with love. AudioFile Earphones Award Vibrant L.A. will leap into the minds of listeners in this audio homage to Korean-American chef Roy Choi's path to street food stardom. The accompanying picture book's illustrations are eye-popping, and Los Angeles-based graffiti artist Man One's narration has a style all his own, especially his rap delivery of the book's short cooking poems. Co-author and co-narrator June Jo Lee's bright voice delivers definitions for young listeners to bring helpful context to the story. Combine all these elements with various rhythmic beats, sounds of the city, and the hustle and bustle of the kitchen, and you could say this audiobook shares a certain awesomeness with Roy's Awesome Sauce. Listeners are guaranteed to finish with a hankering for some spicy food cooked with love, and sohn maash. 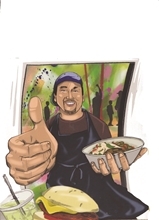 This third book in the Food Hero series features Chef Roy Choi, a “street cook” in Los Angeles whose “best good time” as a kid was family together, making food. Though he became an acclaimed chef, Roy Choi grew tired of working in fine restaurants and started up the Kogi food trucks in Los Angeles, where he could remix the tastes he loved on the streets where he lived – Korean BBQ in a taco. Once folks tasted the Kogi tacos, they lined up, all kinds of people talking and laughing together. Back on the streets, in the food trucks, opening cafes in old neighborhoods, Roy found his “best good time” remixing fast food, remixing neighborhoods, feeding hungry people, cooking up joy. This biography brims with passion and excitement and the happiness that comes from doing what you love while giving back.